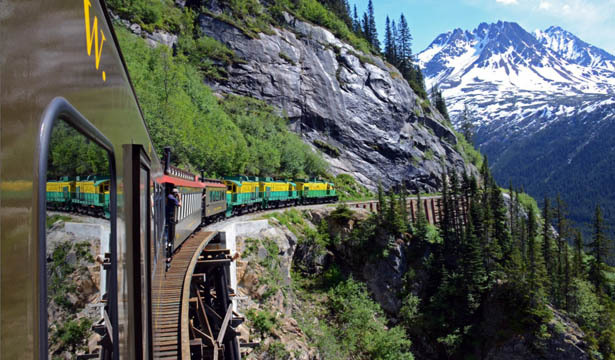 Don't miss any of Skagway's highlights with this tour. 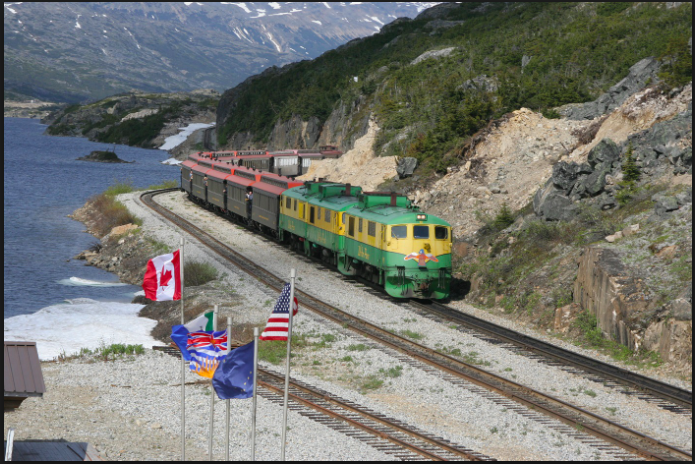 Take a ride on the historic White Pass & Yukon Route train from Skagway to Fraser B.C. Return along the Klondike Highway, making a series of stops at some of the most scenic vistas in all of Alaska. Some of the highlights include the White Pass Summit, "Welcome to Alaska" sign, Pitchfork Falls, Bridal Veil Falls, and Tormented Valley. 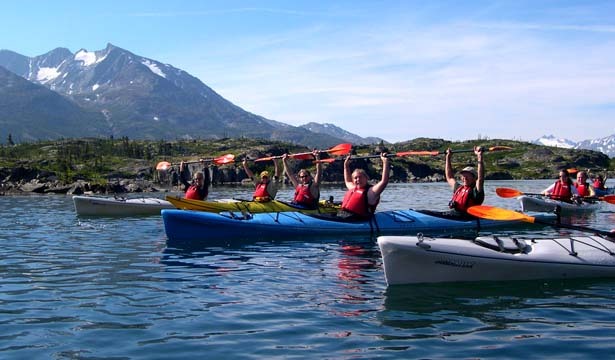 This tour is especially popular with amateur photographers, and anyone who wants to impress their friends back home with a stunning Alaska photo. 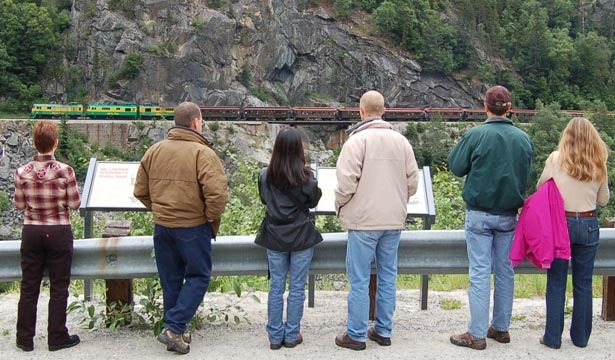 Both the train and the bus tour are fully narrated by a local guide, making this Skagway tour one of our most popular. Limited seating available. Passport required. Canadian Visas may be required for some nationalities. Chilren 2 and under are free. This tour is capable of carrying large groups, but there are a limited number of busses so book early. Some excursions take the train first, and others take the bus first. Camera highly recommended. 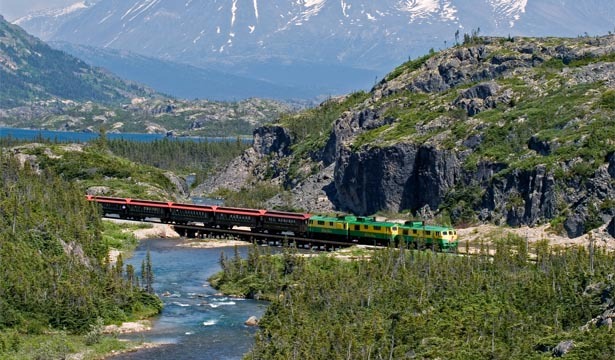 This White Pass & Yukon Route train excursion takes you from Skagway, Alaska to Fraser BC and back without ever having to leave the comfort of your train car. Not only will you get to retrace the steps of the intrepid gold seekers from the Days of '98, your tour guide will point out all places of interest - both historical and natural. 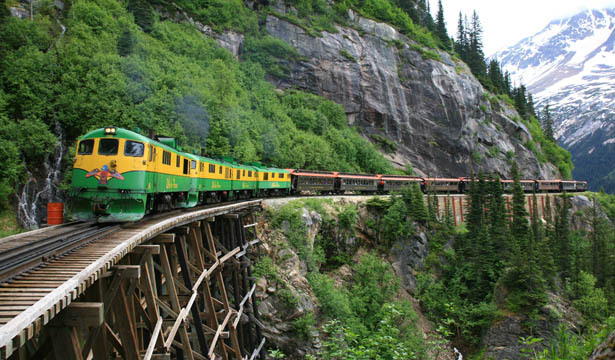 Just some of the sights you will experience on this Skagway tour include beatiful waterfalls, towering trestles, and the ever-present possibility of spotting wild animals. After climing almost 3,000 feet to the top of the White Pass Summit, you will cross over into Canada and continue your journey to Fraser Station where you will have some time to stretch your legs and explore before heading back to Skagway. Passport required. You should plan on arriving early, especially if you have a large group. Children two and under are free. Snacks are available at the depot, but there is no food or drink service on the train. All train cars are heated and have their own bathroom.